Have you ever started something with a specific expectation of the outcome? Of course you have! I finished 2016 with a big life lesson about how detachment from expectations can actually bring something way better. The lesson showed up in the form of a certificate I got in the mail, handed to me by a student. Seventeen years ago, I finished my first masters degree, a Masters in Counseling. When I started this degree, I was supervising a mental health caseload made up of people who had been convicted of federal crimes. This seemed like a good career path for me to get this degree. I envisioned doing talk therapy when I retried from this job 20 years later. I loved working with this population and was really good at it. I completed my masters degree and set out on a 2 year journey to finish 4,000 hours of intern work to get my license to be a Licensed Professional Counselor. Ironically, a large part of these hours were completed by implementing one of my biggest accomplishments with this job: Integrating Yoga, Meditation and Breath Work into a Women’s Program in the criminal justice system, which ended up going national. At the time, my yoga practice, pranayama practice and mediation were not as strong as they are today. I had severe test anxiety that I had not learned how to deal with yet. My LPC supervisor suggested I was smart and should just go take the state test and see where I stood. No pressure, no studies, just take it. So, I did. I failed by 1 point. I did some brush up work and went back and took the test again, this time I failed by a HALF a point! I was so distraught I ended up having a therapy session by phone in the parking lot of the testing center before I could safely drive myself home. Failure wasn’t something I had really experienced. When I put my mind to something, I got it done. I had a 20 year plan and this failure really threw a curve ball into my plan. After the 2nd failed attempt, I decided that I didn’t need this license to do my job successfully and let it go-for the most part. This decision has periodically haunted me over the years. When it did, I took the opportunity to beat myself up emotionally. My last trip to the Himalayan Institute brought about a message from the universe that would help me find closure with this “failure”. I met a doctor who was on the board for the International Yoga Therapist Association. After talking to her about my background, experience and education, she suggested I go ahead and apply for the Yoga Therapist Certification. On the plane ride home, I started filling out the application and making a plan. I had to submit a large amount of case studies, which opened my eyes to see how much I have been able to contribute in 16 years. My application was over 40 pages and had to be sent in 2 attachments. One morning, after class, Gail was leaving class and brought the mail up to me. In this mail was a certificate, awarding me as a Certified Yoga Therapist. I couldn’t believe the wealth of emotions this brought up. Finally, all that work I did was getting counted towards something. And where it “counted” I find more meaningful. The universe provided closure in my studio presented to me by a student. How cool is that?!? You see, it took me 16 years to learn that my expectations to outcome were not what my life’s journey were supposed to be. I wasn’t meant to sit in a chair and do talk therapy, although I am quite good at that. I was born to help people move and breathe emotions out of the body through yoga therapy. I have been honored to work with cardiac & cancer patients in Kansas City & Dallas. I’ve worked with people suffering from depression & anxiety. I’ve worked with people who needed to find better flexibility and body image. I have opened a yoga teacher training school and helped others learn how to deepen their personal practice and how to teach others safely. I love what I do and am grateful to be able to walk this path. So, when your frustrated about an outcome that didn’t turn out the way you expected it to, perhaps you can let go of your attachment to what you thought should be and see what happens. In my case, my journey continues on a much brighter path than I could have ever imaged. Coincidentally, I have earned 2 Masters Degrees (Masters of Counseling & MBA in Strategic Leadership). Both of these degrees sit in a box in the basement, still in the envelopes they were delivered to me in. I never considered framing and displaying either one of them. 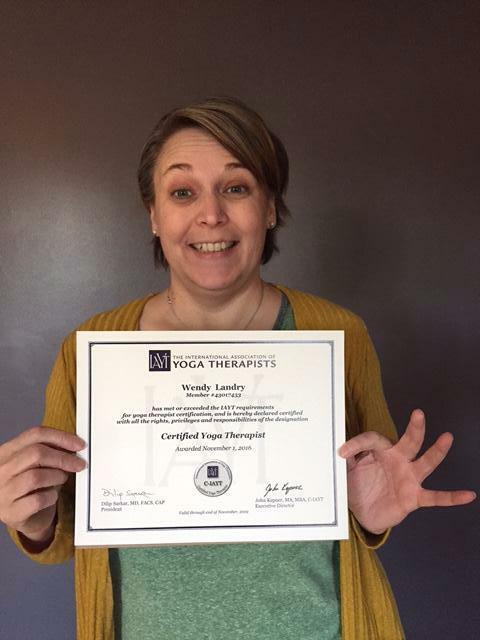 My Certified Yoga Therapist is getting delivered to Parkville Frame Gallery this week so I can proudly display and celebrate my 16 year journey out of this attachment to outcome! PS. Thank you Gail for taking a photo of me with the certificate after you delivered it!